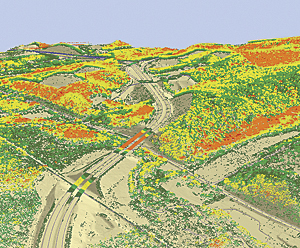 Clayton Crawford, Esri's lidar team lead, discussed the benefits of working with lidar data directly in ArcGIS and the additional enhancements to lidar data handling planned for the near future. Working with lidar in its native format allows you to start working with the data immediately. Earlier versions of our software could import and process the data, but that involved a more protracted workflow. Over the years, that process has worked just fine for lots of users, and they've been able to do many wonderful things. Point profile view of a vertical slice through a forest in the Pacific Northwest. With the profile view, it's easy to discriminate between individual trees and do things like measure height. 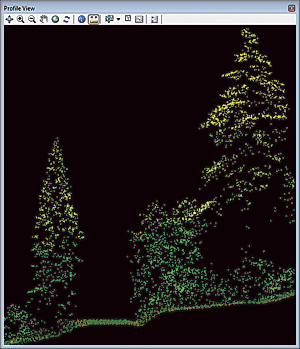 Now the methodology for working with remote-sensing imagery like lidar has been greatly refined to the point where it's little different from 2D imagery in the way we work with it. 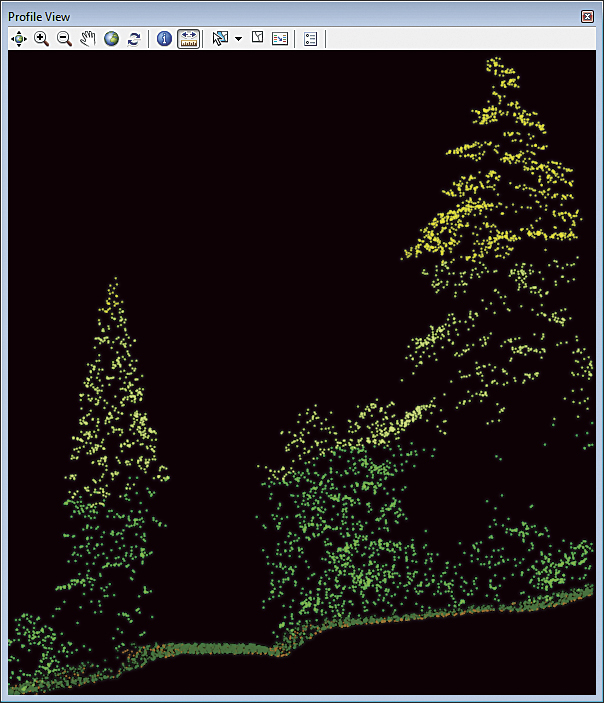 You can have a directory full of lidar information that can be dynamically mosaicked into a continuous surface without having to load billions of points or hiring a vendor to do all that processing. 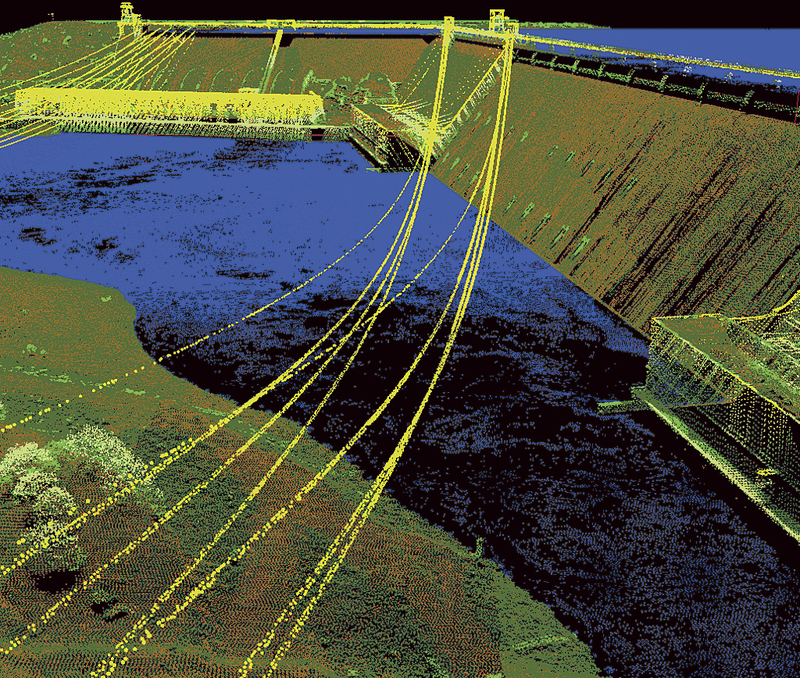 Previously, didn't lidar data require preparation before it could be consumed in a GIS? Yes, by and large, what happened in the past was that data providers would process the lidar and sell their customers derivatives, such as high-resolution DEMs [digital elevation models]. Now, with the tools we've made available in ArcGIS, end users can do that themselves. Another big advantage of that is being able to have access to the source measurements and not just the derivatives. It's valuable to have that source data that those terrain models are based on to fix problems and make improvements. Serious problems need to be addressed by the vendor, but there are often simple things like a few misclassified points that are easier and faster to fix directly in the GIS. Also, if you get ancillary information, like water body shorelines that can be used to make improvements to the DEMs, it's easier to do that when you have the source lidar points. Before, users couldn't make those edits on their own. They would have to go back to the vendor, ask for that information to be processed into new models, and pay for all that extra work. Now, users have been empowered with the tools to avoid having to request updates they can easily do themselves. 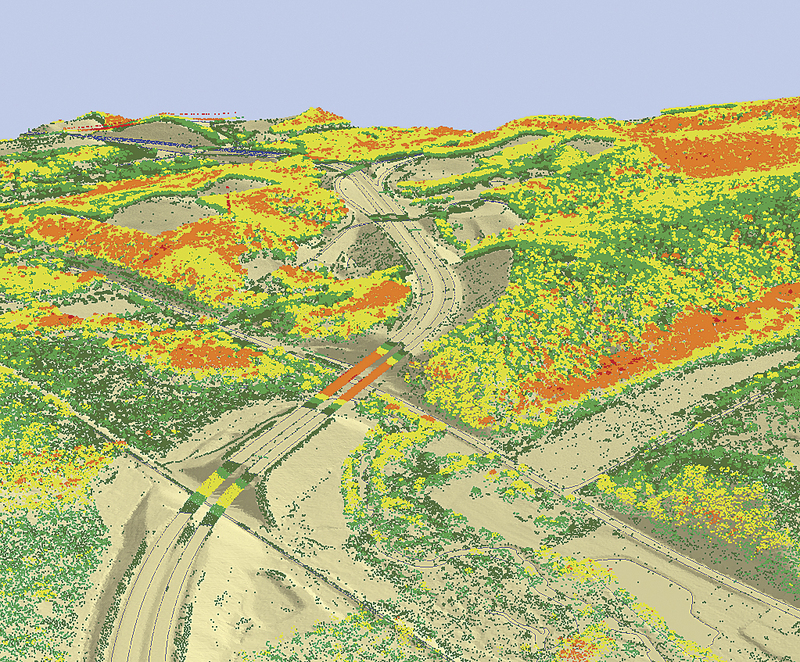 What's the next phase of lidar support? At present, we're working on adding support for spatial indexing on LAS files. This will dramatically improve performance for a lot of things. LAS files don't have built-in spatial index support. If you want to query a subset of data in a LAS file, you have to scan the whole file for the points you want. This is a huge I/O bottleneck. 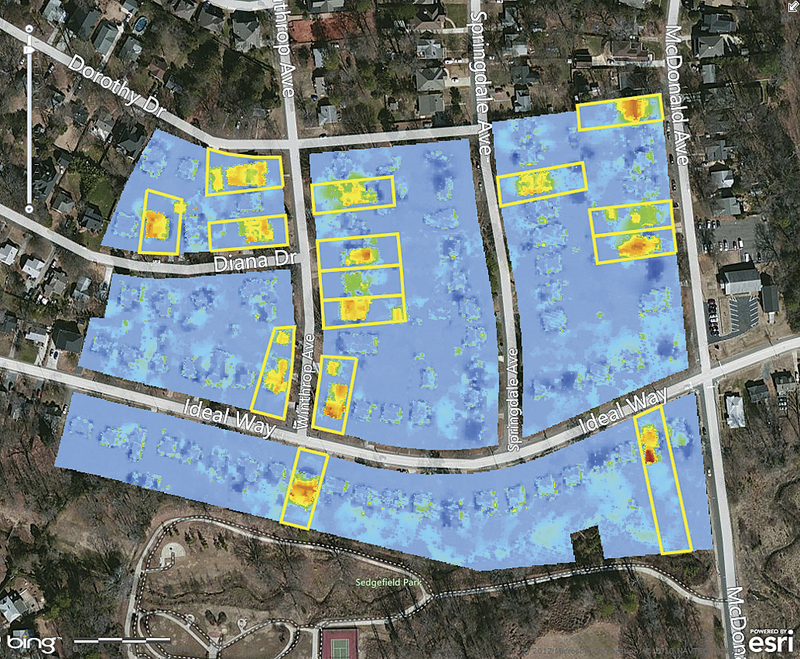 Adding spatial indexing capability makes querying more efficient. We'll see benefits when reading LAS both locally and especially across networks. Looking further down the road, we're investigating advanced visualization techniques, classification tools, feature extraction, and compression. 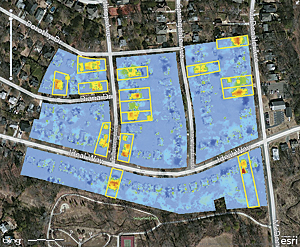 For more information on working with LAS files in ArcGIS, access the topic "Using lidar in ArcGIS" in the online help.